We can understand that... There are lots of attractions and cities to lure tourists to California. We love playing tourist at Disneyland or roaming around San Francisco and Los Angeles. We love road trips too... you may have noticed that. ...And we can tell you that the Pacific Coast Highway is right up there with the best of them. California Highway 1 -- The Pacific Coast Highway (PCH) can keep you busy for a week... easily. A Highway As A Vacation Destination? Well, yes, when the highway connects popular tourist cities and snakes right along a spectacular coastline. Tourists come from all over to see San Diego, Los Angeles and San Francisco. Planes fly up and down the coast between them. But a drive along California Highway 1 will let you savor California coastal views, some cute small towns, taste some wines.... and even visit a castle! So let us give you some road trip planning tips for exploring it. 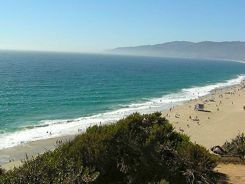 The Pacific Coast Highway stretches all the way from the border of Mexico to the border of Canada, but the most popular section to drive is that part between Los Angeles and San Francisco. This 485 mile (620 km) drive can be done in one day, but we really don't recommend that. Take at least two days for a little sightseeing... stop at the scenic turnouts... walk a beach... stop at any number of restaurants. If you have more time, allow 3 or 4 days or even a week. A week just driving on a highway? No, a week to VACATION... Days full of adventures along a SCENIC highway. We'll give you our tips driving from south to north... only because that's where I sort of took notes when we returned from a visit to my Sis'. And we'll explore it in three sections... From Los Angeles to Cambria and San Simeon; then the central section from Cambria to Carmel and Monterey, and finally from Carmel to San Francisco... remember we told you... you could make this a vacation. The signs may or may not say Highway1.... look for signs to the Pacific Coast Highway or PCH to put the stress of that traffic behind you. Once on it, you travel through Malibu past homes of the rich and famous. You can't get close to most of them... most are in gated communities, but it's fun to look around. You'll find great beaches scattered all along the highway... like this one in Malibu. Beyond Malibu for about the next 75 miles (120 km), you'll pass through farmlands and cities like Ventura and Oxnard. You can see the Channel Islands off the coast. If you want a little time on the Pacific, you can stop in either Ventura or Oxnard and catch a day trip to Santa Catalina or one of the less developed islands. After driving along more stunning beaches, you'll reach Santa Barbara. Stop and explore this attractive town and its Old Mission Santa Barbara, called the Queen of the Missions because it is so lovely. If you have an extra day or two, you can also make a few detours and do some wine tasting. We live closer to the Napa Valley in northern California. Napa is famous for its wines, but the wine growing area around Santa Barbara has has really boomed in the last several years. We often meet Sis halfway to explore the wineries here. Pick up a wine trail brochure from a tourist bureau or hotel and pick a winery or two to visit. Expect to pay a little for the tastings, but you'll find wines as good as Napa's here too. 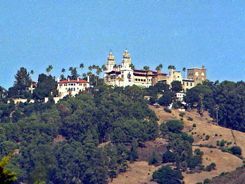 If you have time for more detours, you can also find more of those Spanish Missions that are strung along the length of California. Exits to them are clearly marked along the highway. You will pass through a trio of towns as you head north, any one of which will make a nice base to explore the others. Pismo Beach has an 8 mile long beach and great sand dunes to explore. No problem finding hotels and restaurants here. Camping and RV parks are available. San Luis Obispo is a college town with a nice little downtown and another Spanish Mission. Lots of hotels and restaurants here too. ...and don't end up on the 101. It's actually a pretty drive for the next several miles on the 101, and it will get you into the Paso Robles wine area, but we're telling you about the PCH and we won't go into details on detours now. 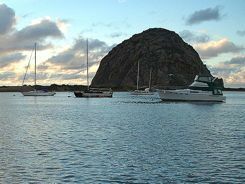 Morro Rock is the huge volcanic rock rising out of the water in the middle of the bay. Restaurants, galleries and an aquarium line its waterfront. There are many good hotels and B&Bs in the little coastal town of Cambria, and it makes a great base to visit Hearst Castle. This palatial estate is a little further north near San Simeon. Hearst Castle was built by newspaper magnate William Randolph Hearst in the 1930's and 40's... and it really does look like a castle. Arrange ahead for reservations for one of the tours... there are several tour options. Tours can be sold out at popular times of the year. We're only about a third of the way up this portion of California Highway 1, the central section of the Pacific Coast Highway, and you already feel like you're having a great vacation, don't you? Told you so. Next you're in for the really scenic part of the drive.